All the Allied offensives launched on the Western Front in September met with various levels of success throughout October. [See status in the right column.] A major French/U.S. offensive in the east was being planned for November 14th for the next phase. However, the big news was that Germany had decided early in October to seek an Armistice. The terms implicit in Woodrow Wilson's Fourteen Points seemed to offer the promise of the most reasonable settlement from their point of view, so the first approach was made to America. The ensuing jockeying among Allies and between the Allies and Germany would consume another month and tens of thousands of casualties as the multiple battles on the Western Front continued with full force. Meanwhile, Italy went on the offensive at Vittorio Veneto decisively defeating the shattered and dissolving Austro-Hungarian Army. General Allenby's forces arrived in Damascus, and hostilities ended in Mesopotamia with an Allied victory at Sharqat. At the end of the month Turkey left the war. The end was approaching. 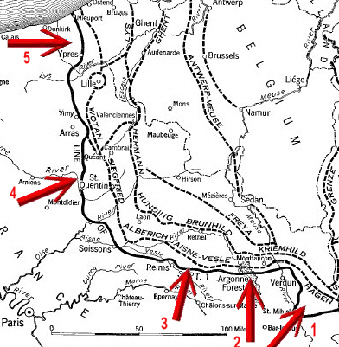 U.S. First Army bogged down on mid-Argonne heights, preparing for renewed attack 1 Nov.
Fr. IV Army, Launched 26 Sep. In Lorraine, France on the morning of September 15, 1918, an American soldier, Corporal Lee Duncan, found an abandoned German war dog station. Inside the bombed-out dog kennel were a starving mother and five puppies. Duncan rescued them all. Three of the puppies found homes in Europe. Duncan took a female and a male back home with him. He named them after the good-luck dolls the French gave to their soldiers, Nenette and Rintintin. Nenette died of distemper, but Rin-Tin-Tin survived. 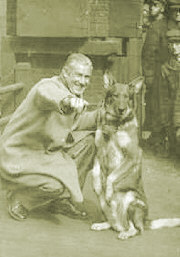 Duncan sought out the German kennel master, who had been captured by the Americans, to learn more about the breed. After the war Duncan returned to his job at a hardware store and attended dog shows. Impressed with the dog's learning abilities Duncan (and his army friend, Eugene Pallette) raised and trained Rinty to perform stunts and obey his commands, preparing him for future stardom. Rinty first found fame when footage of him making a record-breaking jump of eleven feet nine inches appeared in a newsreel. Duncan tried to get Rinty into the movies but was turned down by one studio after another. There were plenty of other animal stars in Hollywood. In fact, there was another starring German shepard in the twenties, "Strongheart" who was hailed by Photoplay magazine as "a dramatic dog; an emotional actor." "Strongheart" was his stage name; he had been born "Etzel," and Photoplay assured its readers he had served in the German Red Cross in the World War. In 1922 Duncan came across a film crew having difficulty filming a wolf. He went to the producer and convinced him to try Rinty. The troublesome scene was completed in a single take. Rinty was used for the rest of the production, Man from Hell's River. It was Rinty's big break. In 1923 producer Henry Rapf approached Jack Warner, head of Warner Bros. to discuss making Where the North Begins, a story about a dog running with a pack of Canadian wolves who befriends and rescues a fur trapper. There was a slight problem--they needed a performing dog. But Rapf told Warner he knew Lee Duncan who had a trained German shepard. Jack Warner wanted to met Duncan and the dog before giving the go-ahead. So Duncan and his dog were introduced to him. Upon entering Warner's office Duncan sat in a sofa chair and pointed with his index finger at his right foot. The dog sat next to his foot. Duncan told Warner how he had found the dog in France. Warner asked if the dog did tricks. Duncan said he obeyed commands. Warner asked for a demonstration. Duncan made a quick hand motion. The dog rose, bared his teeth, and growled at Jack Warner. Warner had once been bitten on his arm by a chimp being used in a movie and the growling dog scared him. He asked Duncan to call the dog off. With a snap of Duncan's fingers the dog relaxed. Duncan pointed to a large chair across the room and made another gesture. The dog ran across the room and jumped over the chair and then returned to Duncan's side. Warner asked the dog's name. "Rin-Tin-Tin" was the reply. Where the North Begins was the first of Rinty's hits that helped make the studio solvent. The films he made from 1923 to 1930 earned over $5 million for Lee Duncan. Jack Warner often called Rinty the "Mortgage Lifter." Warner also liked that, unlike other stars, Rin Tin Tin "didn't ask for a raise, a new press agent, or an air-conditioned dressing room, or more close-ups." There was a formula to most of the Rin-Tin-Tin movies with Rin-Tin-Tin performing action stunts and completing a major task to save the day for his seemingly helpless and confused human stars. The plots are simple and filled with action. They utilized Rinty's athletic skills and acting abilities. 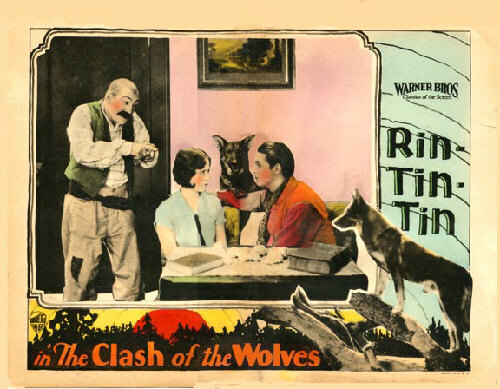 In The Clash of the Wolves (1925) Rinty plays Lobo, a wolf-dog half-breed. Lobo, his mate, puppies and other members of the wolf pack are forced out of the Sierras by a forest fire. When a thorn in his paw threatens his survival, Lobo is rescued by a friendly prospector, played by Charles Farrell. Rinty returns the favor by saving his life from a claim jumper played by Pat Hartigan and helping his romance with June Marlowe (who appeared in five Rin-Tin-Tin features). Lobo has a bounty on his head, so Rinty wears a disguise when in town. In one scene he unlaces his booties to climb up a slippery sloping chute to hurl himself at the villain. When his friend is shot and hiding in a cave Rinty tries to give a message written on a canteen to the heroine, but she's so clueless she gives the canteen to the villain without reading the message. 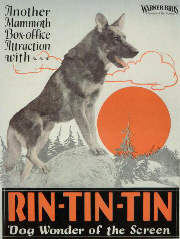 The Clash of the Wolves is the only Rin-Tin-Tin feature currently available in a restored print on DVD. A 35mm South African print was repatriated through the American Film Institute to the Library of Congress and preserved in 2003. The Clash of the Wolves is included in the box set, More Treasures from American Film Archives 1894-1931. Darryl F. Zanuck was working for Warner Bros. as a writer at this time, and he helped to develop the stories that would turn Rinty into a major star. In 1917, prior to America's declaration of war Zanuck had lied about his age and enlisted in the Nebraska National Guard. As member of the U.S. Army's 34th Division, Zanuck went to France, where he served as a runner and a messenger. He was the only studio head (20th-Century Fox) to have had combat experience in World War One. D. Ross Lederman, who directed Rinty in The Million Dollar Collar (1929) commented that "When I worked with him we needed very few retakes and almost no extensive rehearsing. That dog knew just what was expected of him. He would watch Duncan for a signal, if movement was required. He couldn't tell time. But as for emoting, or playing a scene right, he didn't need any coaching. That's the unusual thing about that dog. He actually seemed to understand the story line well enough to bring off his role better than most of the other actors in the picture. I had more trouble with Tim McCoy and Buck Jones later at Columbia than I ever had with Rinty at Warner's. He was one of the few truly professional actors we had in Hollywood at that time. He just went about his business." At the peak of his career, Rinty received 12,000 fan letters a week, earned $6,000 a month and had a valet, a chef, a limo (and driver). Like other silent stars, he had mood music played by an orchestra while he worked. He wore a diamond-studded collar off camera. He had an endorsement contract with Ken-L Rations who used his photograph on their boxes. He was cited by Duncan's wife as the cause of her divorce. He lived the life of a star. He collapsed on August 10, 1932 after playing with Duncan outside their home. Neighbor Jean Harlow ran over from across the street and cradled Rinty's head in her lap as he died. 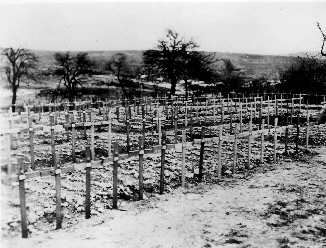 Duncan returned Rinty to France to be buried in the Cimetiere des Chiens, the famed pet cemetery in Asnieres-sur-Seine. Rin-Tin-Tin has a star on the Hollywood Walk of Fame. During World War Two, Duncan contributed to the war effort by training more than 5,000 military dogs and handlers. After the war, he untrained many of the dogs to allow them to be returned to their donating families. Lee Duncan died on September 20, 1960. Finding Rin Tin Tin was released on DVD in September, 2008. Filmed in Bulgaria, it is a highly fictionalized telling of Rinty's discovery on the battlefield in France. However, it does not use any of Rinty's descendents as actors. Miss Daphne Hereford, owner/breeder of the Rin-Tin-Tin line and the associated trademarks has expressed her concerned that this release is deceiving the public. I can say that the best part of Finding Rin Tin Tin is the Bulgarian scenery. The following are thanked for their contributions to this issue of the Trip-Wire: Len Shurtleff, Christina Holstein, Tony Noyes, Andrew Melomet, Tony Langley and Kimball Worcester. Irv Roth provided the Douglas Jerrold pamphlet from his personal collection to us. Until next month, your editor, Mike Hanlon.